At the age of 15, Haben Girma had danced, skied, kayaked and traveled to Mali. And although that’s a lot for any young person to experience, Haben was doing so while deaf and blind. After realizing the power of law, she decided she wanted to pursue a career as a disability rights attorney. Today she is the first deaf-blind student at Harvard Law School. She will be at the University of North Carolina at Chapel Hill in their Student Union at 2pm, giving a presentation hosted by Advocates for Carolina. But first, Host Frank Stasio talks to her about her experience with disability rights advocacy. Frank Stasio: This is the "State of Things" broadcasting from the American Tobacco Historical District. I'm Frank Stasio. At fifteen-years-old, Haben Girma had skied, kayaked, cycled, danced, and traveled to Mali without her parents. That's a lot for any teenager, but Haben was doing all those things while deaf and blind. And her adventures didn't stop there. She has since become the first deaf-bind student to graduate from Harvard Law School. Haben is a disability rights advocate who is thinking deeply about the ways people with disabilities move through the world. She's giving a talk at the University of North Carolina Chapel Hill today at 2:00, but first she joins us on the program, and Camara Lash is here as her assistant. Welcome. Haben Girma: Thank you so much for welcome here--welcoming me here. It's an honor to be here and I look forward to meeting with students later this afternoon at the University of North Carolina Chapel Hill. Stasio: It's gonna be great. I wanted to ask you, Haben, when you first decided that you wanted to become an attorney. Girma: I decided my second-to-last year of college, and at that time the economy was really bad. And a lot of my friends who were ahead of me in college--graduating seniors--were struggling to find work. So I realized I needed to get--further my education and a law degree would give me the flexibility to do a variety of things. The other thing that really inspired me is that due to my limited vision and limited hearing, I developed strengths in certain areas and that was analyzing and problem-solving. Having a disability means you're constantly dealing with obstacles, and a lifetime of constantly dealing with obstacles has allowed me to have really strong problem-solving skills, which is great as a lawyer. Stasio: But clearly, if you were the first student to graduate--and I don't know how many students may have gone to Harvard Law and not finished--those obstacles must have been formidable for you to be the first law school graduate from Harvard. Did you anticipate the difficulties in going to law school as a deaf-blind student? Girma: As someone who had never gone to law school before, it was hard to anticipate the challenges. And Harvard Law had not had a deaf-blind student before. They couldn't quite anticipate all the challenges. But we met early on before I started and discussed potential challenges and potential solutions. And we continued to work together to figure out how I would do oral arguments, how I would take my exams, how to do internships over the summer. It was just constant positive creative thinking, optimism, and we--we made it. We got through it. Stasio: Well, some of that you must have gone through in your undergrad and--and even through--through all of your schooling, right? I mean, how--how to handle the lectures? How to interpret and how to get your work back to the professor? So, tell us a little bit about that. How did you do it? How did you get through school? Girma: So I use a variety of com--I use a variety of accommodations. So, for my textbooks and course materials that are in written format, teachers give that to the disability service office and they convert it into braille. So when you have something in a digital format, you put it in a program called Duxbury, and that program embosses it in a print--in a braille printer of sorts. That was when we had my materials. Another way is through digital braille, and there are digital braille computers, maybe 20 different kinds of them. And the one I have is called a BrailleNote, made by HumanWare. So I could put files on a USB drive and put it in my digital braille computer and read files on that computer. And right now, here at the studio, as you ask questions, I have an assistant, who's typing those questions on a wireless Apple keyboard, and that's transmitted to my digital braille computer, and I read it in digital braille. And that's one way--one method I use for communication. I've used that at school, at work, and in social settings. Stasio: Now, obviously you are somebody who was very active and very confident growing up. We talked about rock-climbing and kayaking and all the activities that you were involved in. Did you feel limitations growing up? Did you--or let me put it another way--did you have the sense that you really had to show people that you--that you weren't limited? Girma: Yes, and also I had to show myself because growing up there was a part of me that always wasn't sure. Can I really rock-climb? Can I really go to college and get a job? There's a social message unfortunately in our society that says people with disabilities can't achieve, can't succeed. And sometimes we inadvertently internalize those messages. And growing up I was struggling not to internalize those messages so I needed to convince myself and convince people. And now I need to do less of that. I'm fairly confident that I can do things and I don't need to convince myself, and I'm less concerned about convincing other people, because it's only to an extent that other people's opinions matter. You can't let those opinions control your life. Stasio: Tell us about that trip to Mali when you were fifteen years old and volunteering on your own. What were you doing and how did that trip go? Girma: I was part of an organization called Build On, that builds schools in third-world countries. And I asked the program coordinator if I could go. And she said, "Absolutely!" She gave me the application and I gave it to my father. And I told him, "I want to help change the world! I want to help work towards world peace and build schools in rural Mali, West Africa!" And my dad actually grew up in Africa. He was highly aware of all the dangers in Africa and he said, "There's snakes. There's malaria. It's not safe. And you're deaf-blind. If you can't see a snake, what if you step on it? And if someone were to warn you, 'Oh, there's a snake! Watch out, Haben!' you might not hear them." And my dad's points were very valid. He was right, and he loved me. He was just concerned for my safety. So I--I was trying to do this balancing act of assuring my father that I would be safe, and that the trip would go well, but also, trying to figure out how would I avoid those dangers? And how do I overcome my own fear of snakes and feeling like a burden for this group who's trying to build schools? Stasio: So that gets back to this added skill--this--this kind of genius that you have for problem-solving because you're always faced with these challenges of trying to prove to yourself, and others I guess, that it's gonna be okay. Girma: Right, it was hard to prove to myself and prove to others that I would be okay. In that situation, what I ended up doing is I brought the program coordinator into the conversation and I told her my father's concern for my safety. And actually I'm also a little nervous and concerned for my safety too. She said, "We've never had a deaf-blind student attend this program and build schools in Mali. But I'm willing to make it work. We'll find a way." And so she and my father talked and we realized that I would never be alone. I would always have a team. We were going to be a community of high-school students and teachers going to help this village. And she was absolutely right. When I was at the village, I always and people around me. My host family was wonderful. And I was out there, digging and mixing cement and building that school. But I also had people to describe, "All right this is where the bricks go and straight ahead ten feet into the left is where we're going to have dinner." So a combination of teamwork and support, and assuring my father that we would all be together, and to trust me to be careful was our--was our eventual solution to the--to the dilemma. Stasio: So I want to take you back to law school now, and Harvard, and some of the challenges there. And you talked about getting--getting your material translated into braille. So that's one way that you can use technology, but then you ran into another challenge that maybe you hadn't anticipated, and that's how--how are you going to get the lunch menus? Tell us--tell us that story. Girma: Um, so the--the lunch menu story was actually in college. The college cafeteria prints out menus and puts it in front of the cafeteria. But I couldn't read the menus, so they advised me to ask people to read the menus to me. The college cafeteria's very loud and noisy, and it was really difficult to hear people. So for the first few months I said, oh well, I just need to eat. It really doesn't matter too much what I eat. So I'd go up to the counter and hand them my plate and they would put food on it. And then when I sat down I'd found out--I'd find out what they'd served. But eventually, I--I realized that I wanted to be able to choose what I eat, especially since I'm paying for this service. And school gets stressful, and sometimes it's nice to know chocolate cake at station 4! Yes! So that you can relax and enjoy and prepare for the next exam. [Frank laughing] So I asked the cafeteria to email me the menu. Ideally, I'd love to have it in braille, but if they couldn't do that, then they could just email me the menu because they print it out. It's already in digital format for them. They said, "all right" but they failed to do that. They'd send it to me once every two days, or not at all for awhile, and I came again and asked, and they said "sorry we're too busy". But again I was paying for this service and it's--it's stressful already to be a student and to be studying for exams, and on top of that I had no choice about what I would eat, and I was eating three meals a day at this cafeteria. I was staying at the dorms. So eventually I told the managers that under the Americans with Disabilities Act, they were required to make reasonable accommodations, and easily emailing a menu is a very reasonable accommodation. And reminding them about the law really made a huge difference. It changed their attitude from "this is a favor we can do when we have a spare time" to "this is actually an important thing we need to do; she's paying for this service, and she should be able to choose what food she's going to eat". Stasio: And I guess this brings us to the importance of your work as a disabilities advocate. Could you tell us about that and what you intend to do as an attorney who specializes in that kind of advocacy? Girma: So, right now I work at Disability Rights Advocates in Berkley, California. They have two offices--one in Berkley and one in New York. And they do high-impact litigation. They look for large problems of discrimination and work to improve access to education, employment, life for people with disabilities. And it's non-profit, no charge to the clients for the good cause of making the world a better place. My issue over there is education and I work on education cases for students with disabilities throughout the country. Stasio: What are some of the big challenges? You know, it's obvious to me that digital technology in some ways can make it easier, but I guess not everybody has access to that and so is that one of the challenges, to make sure that deaf-blind students and others with disabilities have access to the technology that would make it better? Girma: One of the biggest issues is definitely technology, and the funny thing is, technology has the potential to make life so much easier, rather than having print books for sighted students and braille books for blind students, you can give students one device, like an iPad, and everyone can read it. Because the iPad has the potential to provide information in various formats--audio, large print, regular print, and it connects to digital braille displays. So what I want to try to stress to universities is that when they invest in new technologies, when they build online learning tools, think about accessibility because there are small changes you can make that would make it easily accessible to hundreds and hundreds of students. Stasio: What does it mean to you to be the first deaf-blind student to graduate from Harvard? Girma: One interesting little tidbit? Helen Keller actually went to Radcliffe College, which is now part of Harvard. So I'm not quite the first deaf-blind student at Harvard, but I think I am the first deaf-blind student at Harvard Law School. What that means to me is that we've come a long way in terms of social barriers. Twenty years ago, I don't think we would have had the social environment at Harvard for administrators to say, "Yes! We're willing to make this work!" and sit and think about creative solutions for making this possible. Nor did we have the technology twenty years ago, like digital braille displays, to make this possible. So the fact that a deaf-blind student graduated from Harvard Law School says that Harvard, and the country as a whole, has come a long way in allowing students with disabilities--even so-called "severe" disabilities--to get an education and find meaningful work. Stasio: Now, you--you referenced Helen Keller and of course, she was an important role model. But now that you say it, she's the only other one I can think of. Are there others? And--and is that something that you're, in a sense, trying to do, to create a larger body of role models and people who we can look to? Girma: There is a community of Deaf-Blind people here in the U.S. Not large, but more than me, for sure. [laughing] And we--and so, off the top of my head I can think of five lawyers in the United States and one in Sweden who are deaf-blind. And deaf-blind individuals in other fields doing great work. And they all use a combination of communication styles from tactile sign language to voice to digital braille, close-up signing. The Deaf-Blind community is very diverse. Some have additional disabilities, different levels of vision and hearing. The stereotype is a deaf-blind person's completely deaf-blind like Helen Keller, but I use the term "deaf-blind" to steer away from hierarchies. Rather than dividing up the community into partially-sighted, totally-blind, hard-of-hearing, totally-deaf, use terms that bring us together and bring more people together so that the deaf--the disability community can ask for legislation, ask for policies, that makes--that make a larger difference. Stasio: Haben, what is your message today for the students and those who are--will be in your audience at the University of North Carolina? Girma: My message to students today is to think of themselves as part of a community, regardless of whether they have a disability or not. That they are part of community, and should help each other out. Students who have differences, like disabilities, should be excited to identify as someone with a disability. So I mentioned earlier that I choose to identify as blind even though I have a little vision. I used to say that I was "partially-sighted", but that breaks up the community, so the more united and together we are, the more we help each other out, the stronger the whole community is. And the legal system, the Americans with Disabilities Act--operates on the identification of people who come forward and say "I would like this kind of accommodation. I identify as someone with a disability." So the more we have iden--people identify with a disability, and supporting each other in a community, I think the stronger a community we would have. Stasio: Haben, it was a great pleasure talking with you. Thank you so much for being with us. Girma: Thank you so much for having me here. It's been an honor. 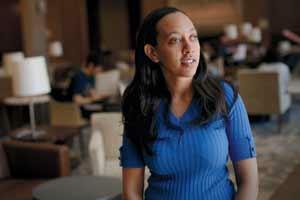 Stasio: Haben Girma is a Civil Rights advocate and the first deaf-blind student to graduate from Harvard Law School. Cameron Lash is here as her assistant. Haben's gonna give a presentation at the University of North Carolina Chapel Hill today at 2 in the Student Union. The event is hosted by Advocates for Carolina. For more information you can go to our website, stateofthings.org. [guitar music] Coming up next, the music of Nick Sandborn and friends, stay with us. This text may not be in its final form and may be updated or revised in the future. Please be aware that the authoritative record of WUNC's programming is the audio.